We don't carry many CDs and tape. Those we do are very important to us because we made them or they benefit our friends or organizations. All are very interesting and worth the purchase. Check out the audio clips / full tracks. Compact Disc - DBS-2707- US$ 12.00 ea. 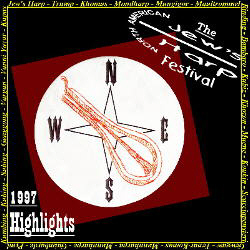 Jews Harp Festival is . . .
musicians from Australia, Austria, Hungary, the Netherlands, and the United States playing traditional, original, improvisational, and uncategorizable music on Jews harp, dumbek, bhodran, Clackamore, cigar box fiddle, mandolin, harmonica, random pieces of wood, and more. A quality recording! You won't believe it was recorded live. Compact Disc US$ 12.00 ea. 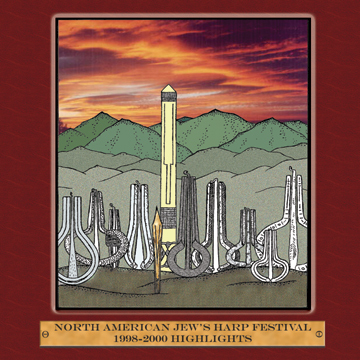 Highlights from the 6th annual North American Jew's Harp Festival. Jew's harps used in a wide variety of music ranging from ol' fiddle tunes, to mild Rock-n-Roll, to spontaneous jams of worldly essence. Some of the best Jew's harpist in North America. 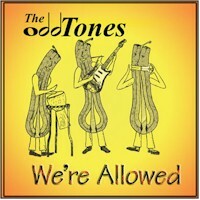 Listen to some cuts "We're Allowed"
Compact Disc - DBS-2204 - US$ 12.00 ea. WAYLAND HARMAN: trumps - micro A and others, mouthbow, clackamore, ashiko (african drum), piano, didjeridu (didj), kalimba. MARK POSS: trumps, kubing, djembe (another african drum), hand claps, vocals, lyrics, throat singing, cymbals, finger cymbals, rainstick, clackamore, guiro, trap set. Compact Disc - US$ 10.00 ea. American jawharpist and editor of the journal Pluck, Gordon Frazier released this ambitious collection of Jew's harp music in 1993. On it you can hear several types of Jew's harps from around the world including: Kumbing, Genggong, Khomus, Austrian Maultrommel and Italian Scacciapensieri, as well as steel 'harps from the US. Compact Disc - US$ 15.00 ea. 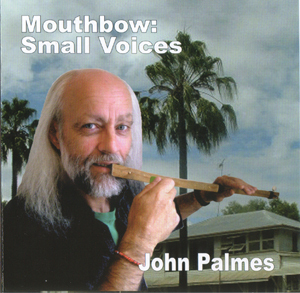 John Palmes, a salmon fisherman and folk musician from Juneau, Alaska, is a friend of ours and has hosted many Mouthbow workshops at the North American Jew's Harp Festival over the past several years. We are proud to stock his unique CD and further promote all types of Mouthbow music. This CD was reviewed on NPR's "All Things Considered". Cassette Tape US$ 5.00 ea. An eclectic collection featuring Mouth Cavity instruments: Clackamore, Didjeridu, Jew's Harp, Kubing and MouthBow. Wayland Harman is a columnist for the Jew's Harp Guild newsletter the Pluck-n-Post, instrument inventor, and former Emcee of the North American Jew's Harp Festival. This 1997 release shows off the unique sounds of these unusual instruments.